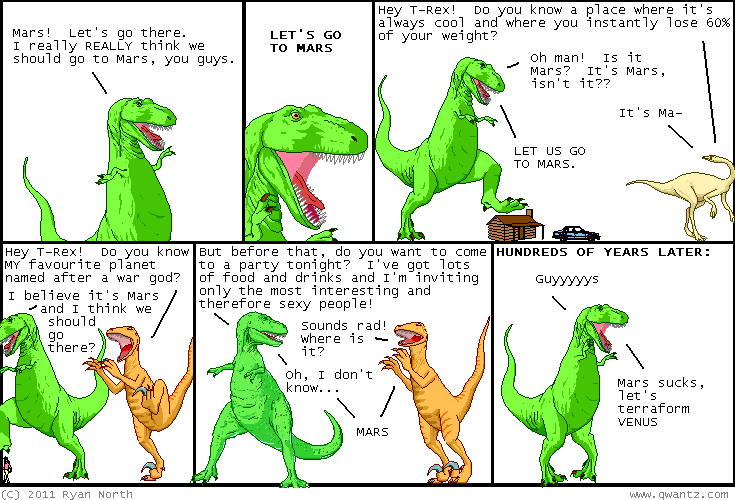 Dinosaur Comics - July 12th, 2011 - awesome fun times! –Dudes! That's not that many dudes! July 12th, 2011: Dawn of Time ended yesterday (at least for now!) and if you haven't read it yet, now is your chance! You can start at the first comic and read the complete story. It's really good! Dawn is a cavewoman in a fur bikini and she hangs out with dinosaurs. If you have ever stared intently at the woman in panel 4 up there and wondered what if, what if then this is the comic for you!